Welcome to the ELAP Draft Regulations Home Page! Be sure to check back here often, for important updates. 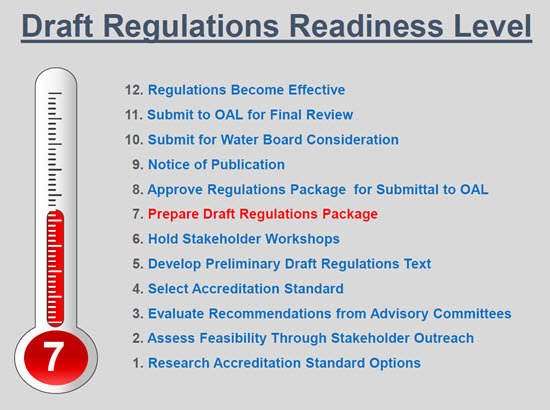 ELAP is pleased to present the Third Preliminary Draft Regulations text for review. The draft regulation text was developed through stakeholder collaboration with suggested changes from ELTAC members and the laboratory community incorporated into the text. The State Water Board is proposing to assist laboratories in making the transition to the 2016 TNI Standard by providing tools, training, and a three-year implementation period for many requirements. We envision a one-day workshop focused on document development that is open to all laboratories. It will be held throughout the state and will include in-class work with a consultant to develop documentation required by the TNI Standard. Laboratories will receive templates and tools as part of this workshop. ELAP is offering support to any laboratory mentor groups that have formed to assist each other with implementation of the TNI Standard. Contact us at elapca@waterboards.ca.gov to see how we can assist you. The following tools are available to TNI members at a discounted rate, but can be purchased by non-members as well. ELAP has negotiated a free 6-month membership to TNI, for its laboratories, which includes member rates on documents and trainings. This membership can be requested until the time the Regulations package is adopted by the State Water Board. Email TNI's Executive Administrator, Suzanne Rachmaninoff, at suzanne.rachmaninoff@nelac-institute.org to request membership. In addition to receiving discounted rates on TNI implementation resources, members also have the benefit of participating in the formal consensus process. ELAP encourages laboratories to take an active role in this process and represent California at the national level. In January 2019, ELAP's Draft Regulations Team held two public workshops in Sacramento and Los Angeles. A presentation was given by ELAP on the Third Preliminary Draft Regulations text, and the public presented oral comments. The Sacramento workshop was webcasted and recorded. The presentation given by ELAP, and the recording of the Sacramento workshop can be found below. ELAP's Draft Regulations Team held public workshops throughout California from July 25th, 2017 - August 3rd, 2017 to solicit comments, answer questions, and review the First Preliminary Draft Regulations text for clarity and completeness. Please see below for more information regarding the First Preliminary Draft Regulations Public Workshops. View our map of public workshop locations relevant to ELAP-accredited laboratories.